Is out in just a few weeks. 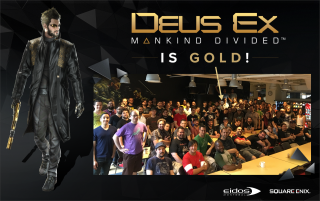 Of course—chortle—Deus Ex: Mankind Divided was already gold, given the overwhelming amount of the colour featured in both this game and its predecessor. But 'gold' is a term that here means ' the game is done', and it's very unlikely to suffer another delay like the one that pushed it from February into the mechanical hinterland of August. The Deus Ex Tumblr announced the news, with a lovely photo of the development team, and a big gold arrow pointing to the tiny master disc that houses the game. If you need more Deus Ex and you can't wait until August 23, why not read our impressions of the first seven hours of the game, from this month's issue.